These are the famous words of American poet Emma Lazarus written about the Statue of Liberty, an international symbol of freedom and democracy. The statue arrived at the New York Harbor in 350 pieces on this day 129 years ago. 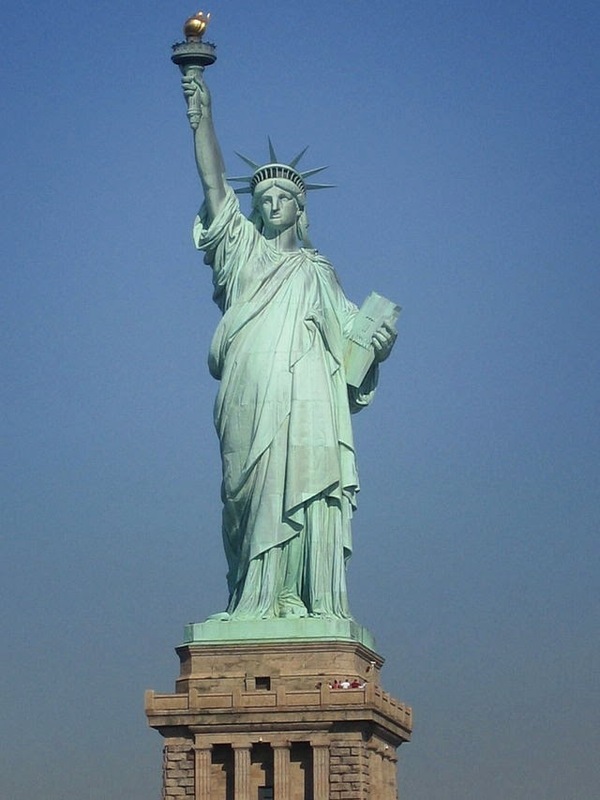 The Statue arrived at the New York Harbor June 17, 1885, as a gift from France to the United States. Originally the statue was meant to be a gift for the 100th anniversary of the United States’ Declaration of Independence, but due to fundraising difficulties it was not finished in time. Instead it became a gift of friendship between the two nations and commemorates the American Revolution. 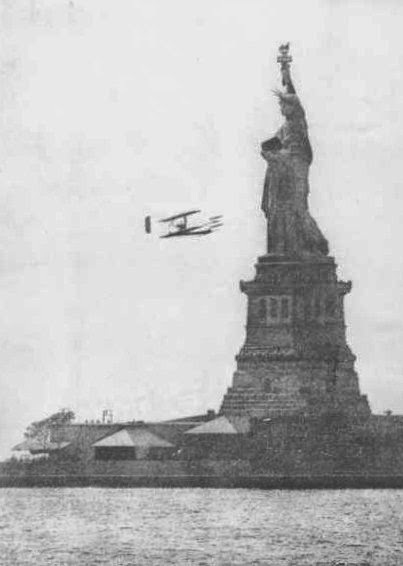 Wilbur Wright flies around the Statue of Liberty in 1909. The statue was completed in Paris in 1884; it was then dismantled and shipped across the Atlantic Ocean in more than 200 separate cases. It was reassembled over the following year and dedicated with a ceremony on October 28, 1886 by President Grover Cleveland. 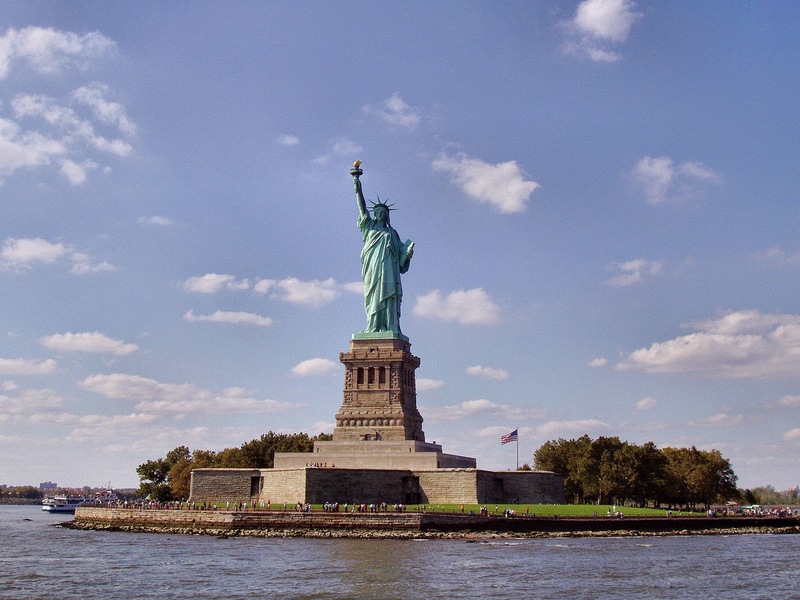 The statue resides on Bedloe Island between New York City and Hudson County, New Jersey. Bedloe Island was later renamed Liberty Island and carries that name to this day. The French sculptor Frederic-Auguste Bartholdi designed the statue with help from French engineer Gustave Eiffel. Bartholdi modeled the statue after his mother. The statue weighs about 450,000 pounds and is over 305 feet tall from the base of the pedestal to the top of its torch. At first, the statue was a copper color, as it is made of copper and iron. Over time a natural color change occurred and created the greenish-blue color that we see today. Six years after the dedication, Ellis Island was opened near Liberty Island as the main immigration center for the United States. For 62 years after Ellis Island’s opening in 1892, the Statue of Liberty watched over more than 12 million immigrants who arrived at Ellis Island in hopes of finding a better life in the United States. The words of Emma Lazarus, printed above, became a symbol of the vision that the United States had for itself, a nation of opportunity for immigrants. Want to learn more about American History? Visit the Museum and tour our Revolutionary War exhibit and Hall of Presidents. For more information, please visit our website or call 316.263.1311.